The Earth straddling the limb of the Moon, as seen from above Compton crater. The large tan area in the upper right is the Sahara desert, and just beyond is Saudia Arabia. The Atlantic and Pacific coasts of South America are visible to the left. WAC E1199291151C (Earth only), NAC M1199291564LR (Earth and Moon); sequence start time 12 October 2015 12:18:17.384 UTC [NASA/GSFC/Arizona State University]. From the Earth, the daily Moonrise and Moonset are always inspiring moments. However, lunar astronauts will see something very different: viewed from the lunar surface, the Earth never rises or sets. 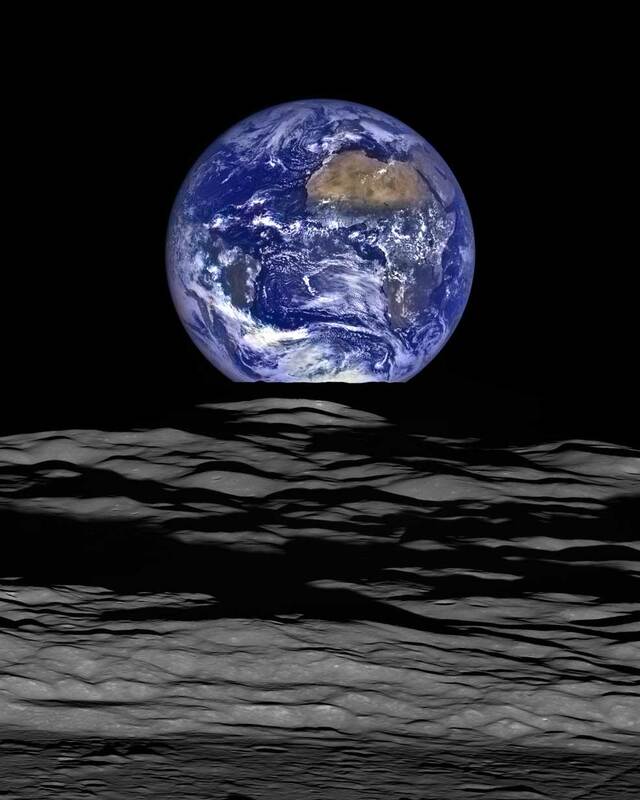 Since the Moon is tidally locked, the Earth is always in the same spot above the horizon, varying only a small amount with the slight wobble of the Moon. The Earth may not move across the "sky", but the view is not static. Future astronauts will see the continents rotate in and out of view and the ever changing pattern of clouds will always catch one's eye. Well at least on the nearside, but what about the farside? The Earth is never visible from the farside, imagine a sky with no Earth or Moon - what will farside explorers think with no Earth overhead? This image was taken when LRO was 134 km above the farside crater Compton (51.8�N, 124.1�E). 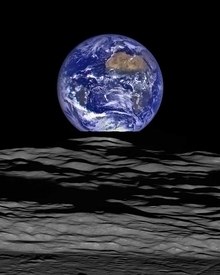 Capturing an image of the Earth and Moon with LROC is a complicated task.